Our cat is elderly, a good 16 years. She is in good health according to the vet. She is and has been spoiled all her life, but until recently would eat her food from the bowl without a problem. The hot weather seemed to knock her for 'six' and she went off her food. The only way we can get her to eat is put her bowl next to her and hope she has a taste. Have tried hand feeding which has been partly successful. Any ideas as to the proper way forward under the circumstances? My thoughts: I'm sorry to hear that your cat is having problems eating. I know you said your cat is otherwise healthy according to your vet, but I'm unclear on how long ago the vet checked her out. Has your cat been checked by your vet with respect to this specific problem? 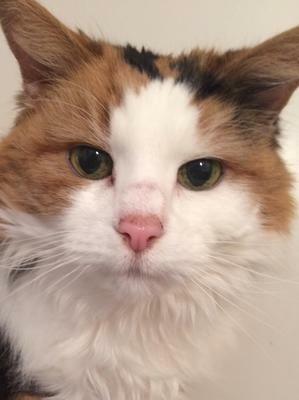 At 16, things are moving quickly and a cat's health status can change fast. One of the first things a sick cat often does is go off of food. If the hot weather was truly the trigger, in addition to any other potential problems, I'd be concerned she might be dehydrated. I would do the skin pinch test and look for other signs of dehydration. I'd also do a follow up with the vet for an opinion, and do what I could to get her to drink more water. That being said, sometimes cats just seem to become more picky about food when they get older. Quite a bit has been written about how to get senior cats to eat (these methods often work on sick cats as well). Warm up canned or moistened dry food in the microwave. If needed, try a few different brands and/or flavors of food. Add some tuna water (only from canned tuna in water). Some of our readers have also had success with crumbling sardines on the food, and others have used baby food (no onions or garlic, though, as these can cause anemia). If your cat is on dry food, switch to canned. Some cats are dry food addicted, but others will appreciate the smell of the canned food, especially if it's warmed up a bit. Feed smaller portions of food more times per day. Keep the environment as stress free as possible and make sure your cat has a quiet place to eat. If she tolerates it, show her some attention while she eats. It may sooth her, but if not, don't force it. Try a balanced, veterinarian approved, homemade diet. See if your veterinarian feels an appetite stimulant is appropriate. I hope that helps, and I hope she recovers quickly. I'm sorry for your loss. We never have long enough with them. RIP Kissen. Update on our cat has stopped eating. and best friend to sleep. We are totally devastated and not really able to cope with our loss. My 16 year-old refuses to eat anywhere except on the floor. I clean it thoroughly before and after she eats. Also won't eat anything but Fancy Feast - and only a freshly opened can, no leftovers. I have to stay with her and mound the food on a spoon so she bites it off instead of just smashing it all down after she's licked all the moisture out of it. She only eats a tiny bit at a time, then comes back for more again and again. We think that Kurt covered everything pretty thoroughly. Perhaps, standing with your kitty while she eats would help her. If she tolerates that, speak softly to her with words of encouragement. We have found that often works with our older kitties.Sometimes I think that they just need an acknowledgement that they are vital, wanted, and loved. I do agree that the sense of smell might be waning. Pungent sardines or other fish should perk her up a bit. If the hot days are getting to her, perhaps keep her indoors with you. That fur gets mighty hot in summer ! Totally forgot earlier: Has anyone looked in her mouth in very recent history? Lumps, bumps & toothaches may happen overnight. Nobody, human or feline, wants to eat if it makes your mouth hurt worse. Totally agree w/: 1. Vet; 2. Heat food; 3. Add flavor enhancers; 4. Change dishes. I would add: 1. Several flavor additives available at pet dedicated stores, locally & online; 2. Remember,if you change more than one thing at a time, you won't know what worked if improvement happens. And, cats seem to get less adaptable to change as they age. What's wrong w/ spoilling her now? Take 5 minutes every two or three hours to do your best to feed & hydrate her. Pay attention to her. You might notice something "unusual/minor/trivial" that will be a lightbulb moment. Love her. I have a cat who is 17 and she has become rather odd due to, she likes to eat off a paper plate and it has to be clean each time. I also have to change her food cause sometimes she will eat lunch meat, sometimes wellness cat food, sometimes Beyond cat food. Your cat is maybe losing some of its smell, so I would suggest mixing a small amount of something strong flavored in her food like sardines or tuna.